I know. I know! But trust me when I say that this is a cake that you can throw together on short notice. A cake that goes with coffee, and friends coming over, children and dogs underfoot. It might be breakfast. It is fruit-sweetened, nut-free, grain-free, and dairy-free, sure. It’s not the healthiest thing you can make, it’s a cake. But a cake that understands. Quick and casual, with a tender crumb but enough structural integrity to eat slices with your hands. But if desired, this cake can be the ride or die, balls-to-the-wall, dank n’ sassy witch of your dreams. I bake it in a little round pan and can’t resist peeking at it while it rises in the oven, domed and fragrant. 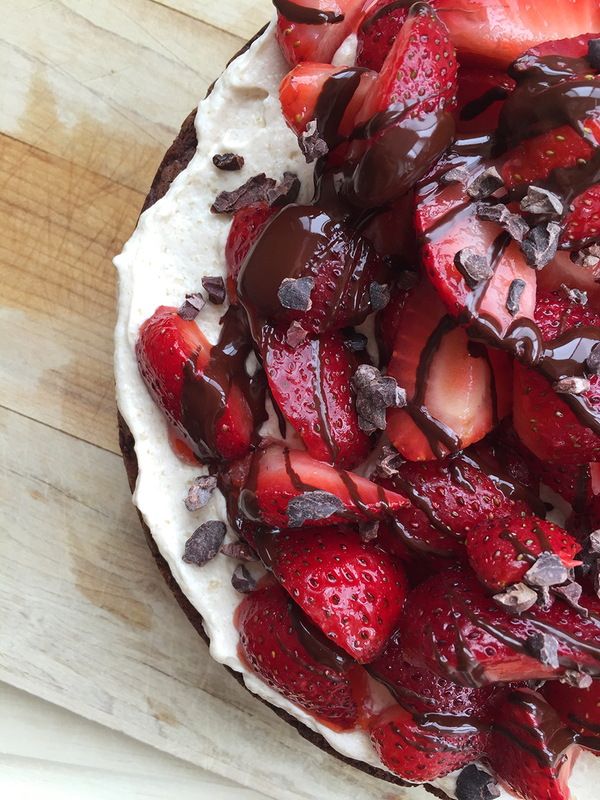 I drizzle some quartered strawberries in honey and vanilla, then when the cake has cooled a bit in its pan, I smear it with frosting, load it with the strawberries and maybe melted chocolate and more honey, maybe cacao nibs, who knows? This cake becomes the type of dessert that draws every eye in the room, but there’s a feeling of spontaneity lurking in its potential when you bring it out that I love. 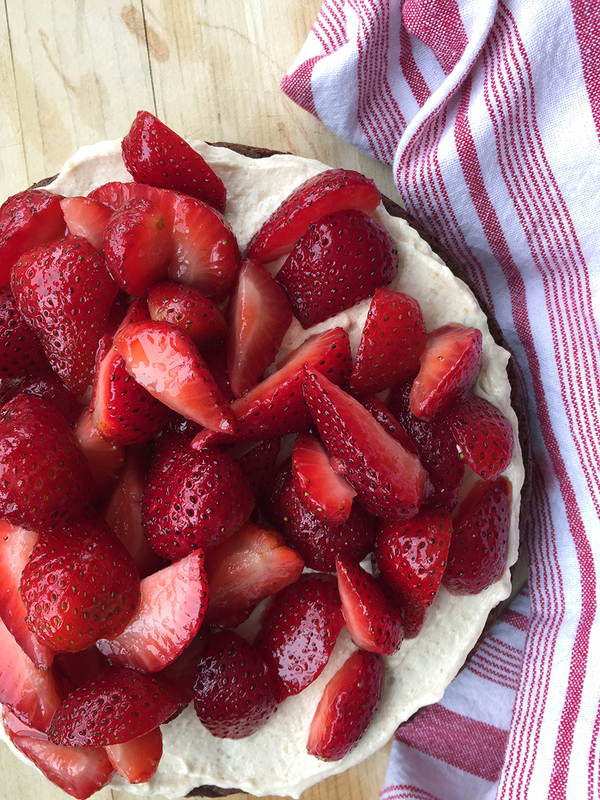 So give this Chocolate Strawberry Cake a whirl, either when you need a quick cake that’s mostly whipped up in a blender to spare you any hassle, or when you need a showstopper of a dessert to doll up and spoil yourself with or take with you as arm-candy to a party. 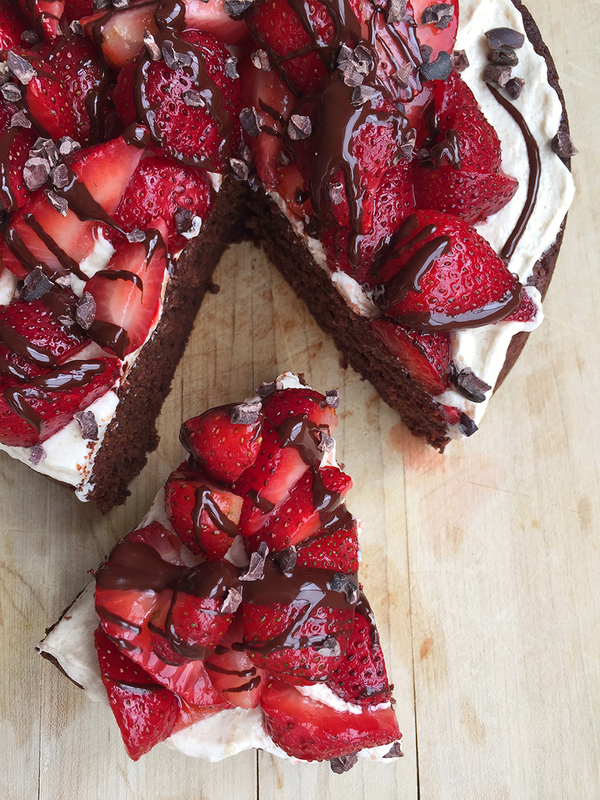 This Chocolate Strawberry Cake looks flashy enough for a party but is simple and healthy enough to snack on every day. Preheat the oven to 350° F. Grease an 8" cake pan and line with parchment paper, set aside. Puree the first six ingredients in a blender until smooth. In a large mixing bowl, combine the coconut flour together with the cocoa, baking soda and salt. Fold the wet ingredients into the dry mix, mix until fully combined. Spoon into the greased pan (batter will be very thick) and smooth the top with your fingers or a utensil. Bake in the preheated oven for 40 minutes, or until a tester inserted comes out clean. Remove from the oven, and let cool while you mix the icing. Combine the icing ingredients in a medium mixing bowl, then use a hand mixer to whip very thoroughly. Use a knife to smooth the icing over the top (and sides, if desired) of the cake. For assembly, mix the scant two cups strawberries with the honey and one teaspoon of vanilla extract. 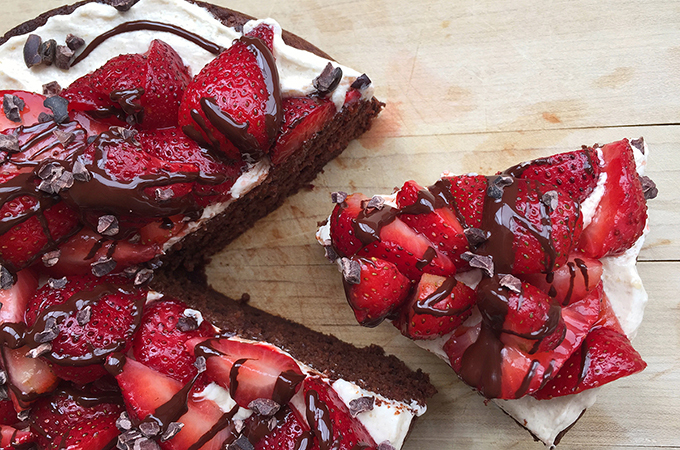 Melt a few grams of bittersweet chocolate, then pile the strawberries on top of the iced cake, streak with melted chocolate and sprinkle with cacao nibs. Best made with very large, meltingly soft Medjool dates. You had me at Chocolate and Strawberries 😉 Yum!!! 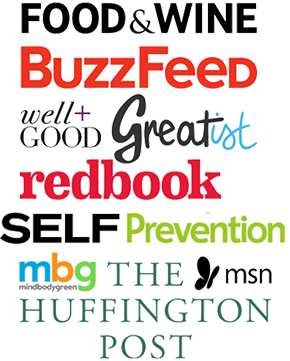 Your pictures are amazing and I am so excited that you utilized wholesome natural ingredients. Can’t wait to make this for my house full of munchkins. Yep, sometimes when stuff is fruit-sweetened a dessert doesn’t quite work… but this one turned out so well! Let me know how it goes. That looks incredible!! I will have to give it a try! Thanks, Nicoleta! Loved taking pics of this beauty. Thanks, love strawberries… so tart and colorful! Oh my goodness, my mouth is watering when I look at these photos. It looks SO delicious! It was! 🙂 Maybe my go-to chocolate cake recipe now! Oh my goodness! That looks so amazing. I want to make it right now – LOL! Chocolate? Strawberries? This is just my kind of sweet treat! I can’t wait to try it! It’s sinfully delicious, yet the ingredients are guilt-free! This looks so yummy!! I like that it does not use gluten! You take the most beautiful photos!! And this dessert looks so divine! Can’t wait to bake this one!! it looks moist and delicious! Thanks for sharing the recipe. Love the recipe… Is it suitable for freezing once baked? Honestly, I haven’t tried to freeze it! Unknown how the pureed strawberries would handle this… Sorry that I’m no help! I froze it without problems. I also tried making it with frozen strawberries and used almond flour for a more adult taste. Worked super! Oh my GOODNESS!! This cake was amazing! It was moist and absolutely decadent! Since strawberries are out of season now, I used raspberries and blueberries. I was too lazy to make the chocolate drizzle, but other than that followed the recipe to a T. I thought it was fairly easy, but am new to cooking paleo so maybe it will get easier with time. Glad you enjoyed! It will get easier with time, and it’s still paleo baking so it’ll always take time and precision. This cake looks lovely! My friend has an allergy to eggs, dairy, gluten and nuts. Is there a replacement for the eggs I could try? Yes, have you ever made a chia egg? 1 tablespoon ground flax or chia seeds plus 3 tablespoons water, then let it sit 15 minutes before using as you would 1 egg. I haven’t tried chia in this recipe, but it’s definitely a possible substitute. Thank you, I’ll give that a shot! I’m confused. I bake Paleo cakes practically 24/7 and how in the world is the only flour in this 1/2 cup of coconut flour. It makes no sense with all those wet ingredients! I don’t believe it. Coconut flour is extremely absorbent. Are you very familiar with it? Coconut flour needs a lot of liquids (it’s very absorbant and can actually make the product too dry if it doesn’t have enough). Did you ever try the recipe? I just made this cake for my dad and his wife. They LOVED it!!! My stepmom kept going back to even out the cake to help it fit in the fridge better. On the other hand I don’t like cake but I have been asked to make it again. I have some questions and comments. 1) My frosting wasn’t white, did you use an amber or light maple syrup? 2) The frosting was grainy. Is this normal because of the coconut flour? Why are there 2 types of flours in the frosting. Normally frosting is butter or shortening sugar and flavoring. Is the flour there to absorb some of the liquid? 3) Have you tried using coconut sugar instead of the maple syrup? It may create a more traditional frosting. 4) I think I over cooked the cake but I was checking it every minute for the last 5 minutes. The tester kept coming back wet. Could this be because I used a different date? I couldn’t find Medjools, I added a few extra because the dates were smaller. 5) Have you ever added chocolate pieces to the cake to make a lava like affect? You may want to state to macerate the strawberries in the honey at the beginning so you can pour the liquid off. I didn’t realize this would happen and had strawberry honey water everywhere. They didn’t care it was yummy Ha Ha. I may pour it in the cake batter. Mind you if I make no changes the they will be extremely happy. I’m just used to traditional baking and want to do the recipe justice. my stepmother has been a baker using gluten free flours but I love that this is gran free because that is how I’m trying to eat. I was hoping it would be more like a chewy cake but knew it wouldn’t be because you talked about it having a nice crumb which it did. Any suggestions comments questions please let me know. I would love to hear what you have to say. I gave you a 5 star because of how they loved the cake. I never give 5 stars because I never find something everyone loves well this they did. Thanks for posting the recipe!! Hi, I was wondering if I could use regular flour and almond milk instead of the coconut flour and coconut milk. I’d like to bake it for my birthday tomorrow! Haha. Thank you! 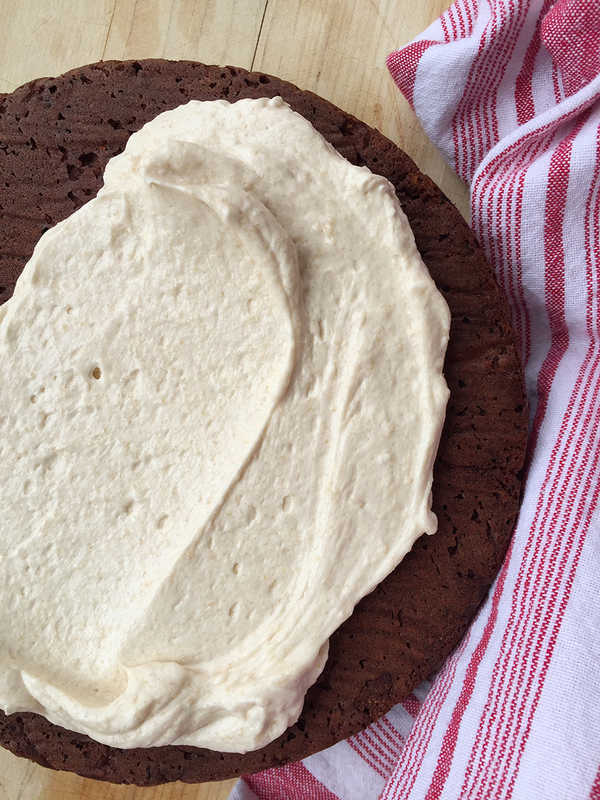 Also, your photos make this cake look amazing, hence why I really, really, really want to make it. I also love the use of dates as the sweetener. Goodness, I have so little experience with regular flour! Been years since I used it. I will say that coconut flour is extraordinarily absorbent… much more so that regular flour. You might taste the coconut… I think almond milk would work. I can’t find coconut flour around here, can I use spelt flour? but, I know it’s probably going to change the whole recipe completely. Do you know how I could make that work? Oh, my goodness. 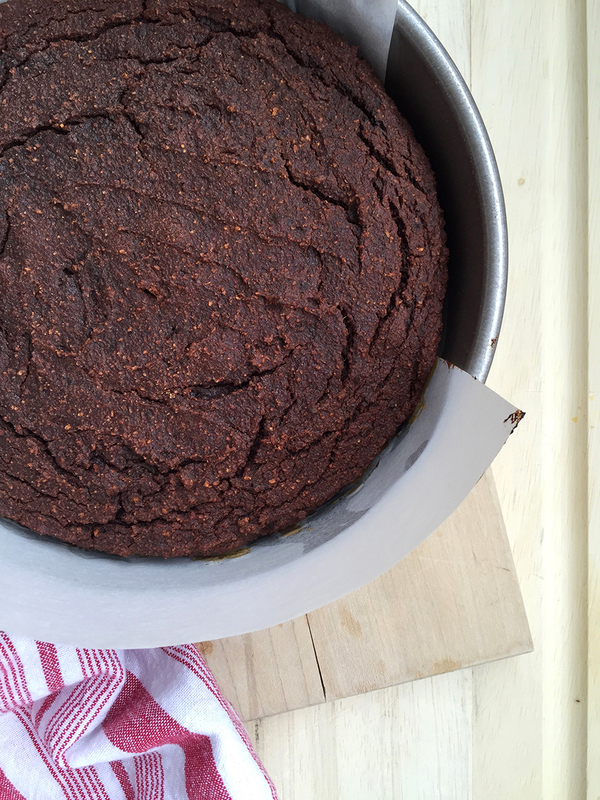 Coconut flour is very different than spelt… but I don’t have much experience with the latter. Best guess would be to cut the liquids in the recipe in half, but I haven’t experimented with grains in years.